Smart, stylish, and highly functional, a Smeg Freezer embraces the very latest technology to offer freezer solutions that are perfectly equipped to accommodate the demands that often come hand in hand with everyday life. Boasting a number of top features including an A+ energy efficiency rating, ample storage for all of your frozen foods and a Fast Freeze Function that has been designed to lock in the flavours and nutrients of your favourite products, our Smeg Freezers will certainly not disappoint. Offering exceptional performance in a range of kitchen environments, you will find a variety of high performance models including the iconic Smeg Tall Freezer which is available in a variety of modern colour ways. Perfect for adding a new and exciting dimension to your kitchen space, the Smeg Tall Freezer proves that retro design certainly has a place in today’s modern kitchen. With its 197 litres of storage space, unique styling, fabulous freezing and bold personality, this Smeg favourite is sure to become a welcomed addition to your kitchen space. 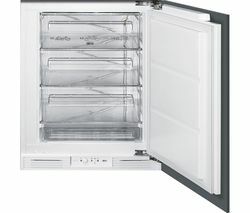 Providing more than enough space to store all of your weekly essentials and those extra treats to keep your household happy, prepare meals in bulk to save time and money and of course, keep your ice cream supply stocked up so that you are always ready for movie night, this freezing solution certainly proves that both style and function can work together with effortless ease. Awarded an A+ energy rating, this Smeg freezer is super-efficient, keeps your energy consumption low and therefore, costs less money to run. 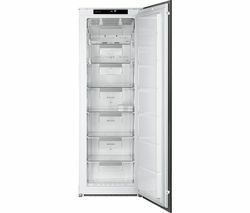 And if you can’t find what you are looking for in our Smeg fridge freezer range, don’t worry, we also offer an impressive range of other chest freezers and fridge freezers, from some of the industry’s leading names including Beko, LOGIK and Kenwood.